A multigenerational vacation that offers flexibility for family members of different ages. Planning a multigenerational vacation isn’t always easy: It entails finding a destination that can flexibly accommodate the diverse needs of people of varying ages, who usually have different needs, interests and lifestyles. Whether a family is celebrating a milestone birthday or anniversary, or simply want to relax and spend time together, Grand Velas Riviera Maya is ideal for these multigenerational get-togethers. Located along the southeastern coast of Mexico on the Yucatan Peninsula, this all-inclusive resort offers varied accommodations, activities and amenities so there’s something for everyone. The resort is set on 205 sprawling acres of tropical jungle located only 40 minutes from Cancun International Airport. After passing through a dramatic walled entrance to the property, guests are transported along a meandering mile-long interior road that cuts through lush vegetation until it reaches a 1600-foot sandy beach beside the Caribbean Sea. The resort is subdivided into three discrete sections, called ambiances, nestled throughout the property: Grand Class, Ambassador and Zen Grand—each one differentiated by style, location on the grounds (beach vs. jungle), special amenities and price points. With only 90 oceanfront suites, Grand Class has the feel of a luxury boutique hotel. The 1377-square-foot units are enormous, larger than most hotel rooms and even many apartments. They have floor-to-ceiling sliding glass doors that open to expansive patios or terraces with private plunge pools. Our suite, 3067, couldn’t have been more spacious or sybaritic: A large flat-screen TV on a swivel divided it into a living area with comfortable seating and a king-size bedroom, both with views of the sandy beach and aquamarine waters. The mammoth marbled bathroom had a walk-in closet, separate water closet, large Jacuzzi tub, separate stall shower, and double-sinks with a huge countertop. Limited to adults and families with children over the age of 12, Grand Class guests have access to a private oceanfront pool, 24-hour concierge service, and a fully stocked minibar with domestic and premium liquors as well as snacks. It might especially appeal to grandparents, aunts or uncles who want to be near but apart from the rest of the brood elsewhere on the grounds. Families traveling with kids would probably elect to stay at the 195-unit Ambassador Class ambiance. A high-tech Teens Club (for teens 13-18) offers electronic games, videos and movies as well as pool, table hockey and foosball. At night, it morphs into a mini-disco with karaoke. The Kids Club (for kids 4-12) offers an inviting space that allows children to participate in supervised play and educational activities as their parents unwind. Many of the 1270-square-foot suites have ocean views and connecting doors for families with multiple children. The adjacent infinity pool has a splash area just for kids. Surrounded by jungle and nature to promote relaxation, the 206 family-friendly Zen Grand suites are only slightly smaller. Many are sited along a series of water canals, where guest can sit on their spacious patios and see lily pods and water turtles. The ambiance also offers a series of lovely pools and lounge areas set among the mangroves, and walking paths that lead to a greenhouse and meditation garden where kids and adults can spot birds and animals. It also has its own Kids Club. Although Zen Grand Class is located about ¾ of a mile from the beach, the resort has vans that loop continuously from place to place on the property. The shops, restaurants, and tourist attractions of nearby Playa del Carmen are only five minutes away by car but there is little reason to leave the grounds or the excellent on-site dining venues. Grand Velas Riviera Maya has six bars and five gourmet restaurants: Frida (Mexican), Sen Len (Asian Fusion), Lucca (Italian), Piaf (French, recipient of a Four Diamonds Award from AAA) and Cocina de Autor (Basque-inspired). Cocina de Autor is the first all-inclusive restaurant ever to receive an AAA Five Diamonds Award. In addition to 24-hour room service, guests can choose from the extensive buffet at Azul or order off the menu from the Bistro or Chaka, during daytime hours. In every venue, the menus were inventive and the foods beautifully presented. The property’s impressive Grand Velas Spa (named best spa in the world by Virtuoso) and Convention Center, each with about 90,000 square feet of space, are located adjacent to the Zen Grand Class ambiance. With 40 spa suites, guests can indulge in a variety of organic health and beauty treatments inspired by indigenous cultures. The sensuous 7-part Water Journey at the Grand Velas Spa (with separate facilities for men and women) includes an experience pool, steam room, clay room and ice room. The setting and service were so relaxing that I hated to leave the premises. In fact, I seized the opportunity for try my first fish pedicure. Well-equipped gyms are located in both the Ambassador and Grand Zen ambiances. New Family-Reunion Packages: Last month, Velas Resorts announced special perks for family reunions held at Grand Velas Riviera Maya and Grand Velas Riviera Nyarit during 2014 (see link below). 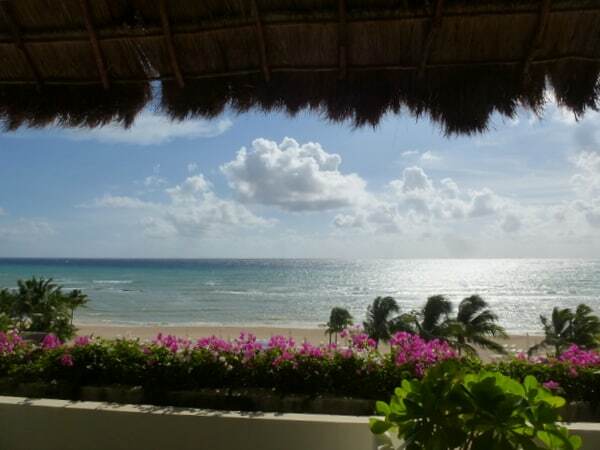 Disclosure: Our stay at Grand Velas Riviera Maya was hosted by the property but any opinions expressed in this post are our own. *Read more about the delicious food at Grand Velas Riviera Maya on Sand in My Suitcase. *This post is part of a LinkUp at Travel Photo Discovery. Check out Distinctive Towns of Hawaii. Anyone would fall in love with that room, Mike. Was SO spacious and had every amenity someone could want including tequila! Hi Irene, such a lovely resort. Love your room with private patio and plunge pool and spectacular view. I love kids but for vacation I’ll love to have an option to stay in the no-kid section. Great to have wide selection of dining options. I definitely would love to go to the Mexican restaurant just to see an original Frida Kahlo art. Book me into 3067, please. Looks like a great location for couples, too. Love the ambiance (all three of them). It’s nice when one resort is so versatile with something for everyone! What an excellent resort for the whole family! I loved all your beautiful photos too. I’ve been there! We were on a press trip with Classic Vacations actually staying at the Zoetry Paraiso de la Bonita (another amazing property) but we went here on a site visit. What an amazing place; absolutely gorgeous. That whole area of Riviera Maya is beautiful and so much more appealing than touristy Cancun. The all inclusive concept is perfect for families. So nice to have everything paid for before you arrive.